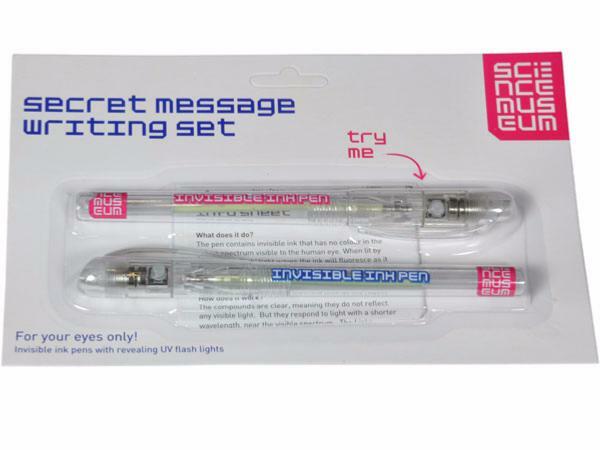 A set of two pens which write with invisible ink. The cap of each pen contains a powerful 'black-light' UV beam, which can be used to illuminate a message, and make it visible.Each pen contains invisible ink, UV lamp, 3 x batteries.Designed in conjunction with the Science Museum, London, instructions are included.Pack is 190 x 120mm. The product is very good and a big hit with my children. I was a little disappointed when one of the pens I received had a faulty connection but Grand Illusions was excellent at sending a replacement the very next day which worked perfectly. I am only scoring good for the product due to this reason, otherwise it would have been excellent. Same quality as your other products.